Ever find yourself needing to take two vehicles somewhere because four or five seats just wasn’t enough? No matter what the reason, either you’ve got a big family, like to haul around friends, or just need the extra seat for your two-hundred pound St. Bernard, you need a vehicle with a third-row seat. It also makes for much easier hauling when you don’t have all the people, as most third-row seats are either removable or collapsible. If you’ve got the need for that added breathing room, stretch out and check out what we’ve found to be the best 3rd-row vehicles for the 2010-2011 model years, according to experts at top automotive researchers Car and Driver, Consumer Reports, Edmunds, and Motor Trend. While the Odyssey does feature an upgraded exterior, it’s the interior that features the most significant improvements. Rear seating has benefitted the most from the improved styling. The second-row seat gains an extra four inches in width, allowing room enough for three child car seats. The center section of the second row actually slides nearly six inches forward as well, giving parents better access to young ones from the front seat. The third-row seat gains an extra inch of legroom; that may not seem like much but anybody who’s ridden in the rear of a minivan can appreciate any extra space given. 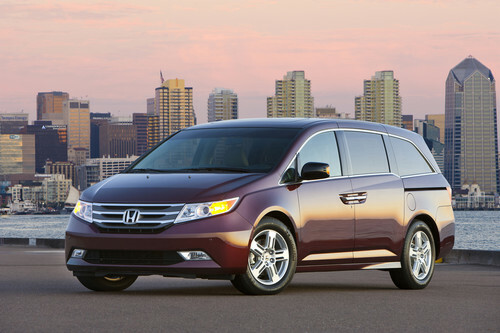 While SUVs offer more storage, it’s the minivan that offers the best third-row practicality, and the Odyssey is the top of the line in that sector. Sticking with the practicality of the minivan, the Sienna features a handsomely-trimmed cabin, especially on higher trim levels where you can enjoy the luxuries of premium leather seating and a rear-seat DVD system. 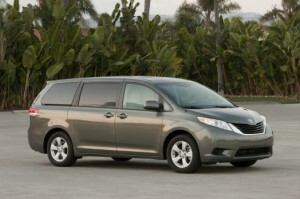 The eight-passenger Sienna offers a 40/20/40-split second-row seat that offers a center section which slides closer to the driver, but the seven-passenger version ups the comfort standards with second-row captain’s chairs that tip forward to allow easier access to the third-row seats. When not hauling passengers, the third-row seats can be stored and the second row removed to increase cargo space to a very ample 150 cubic feet. Models fitted with the second-row lounge seats enjoy premium comfort in reclining seats with footrests, provided the second row is slid back far enough and the front seats forward slightly. 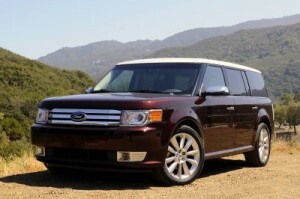 The Flex is the premium of third-row SUVs thanks to its boxy style and comfortable seating in all three rows. Cargo space is sacrificed slightly, but rear passengers will be extremely thankful for it, as the third-row seating can accommodate full-grown adults comfortably. Optional second-row captain’s chairs shrink the seating capacity to just six, but comfort is increased in both rear rows with them, allowing for even more legroom in both the second and third rows. The power-folding utility employed by the second row makes getting to the rear of the vehicle much easier. Large wheels allow the Flex to make bumps in the road seem non-existent. 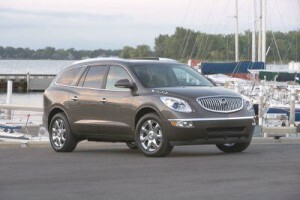 The Enclave’s cabin is both upscale and comfortable in all areas. It features visual aesthetics like chrome trim and wood-grain inlays. The chrome can make sunny days rough as glare becomes an issue, but the wood grain is a nice touch. The third-row seat is less roomy than that of the Ford Flex, and it can be somewhat cumbersome to get to, but it is comfortable and provides a stowaway feature to enhance cargo capacity. The Enclave is actually suited quite well for long road trips as a rear-seat entertainment system is optional and road noise is all but eliminated.